The first message of the 3rd post of 2019 is the continuation of the Season of Light with our first appeal regarding what happened in the Democratic Republic of Congo (DRC) in 2018 and what may happen this year. This appeal is what we call Appeal for Sustainable Peace, Rebuilding Infrastructures and Lives. It is also a call for post-war and post-disaster sustainable development in this country. You can find further details about this appeal under the Main Development section of this post. 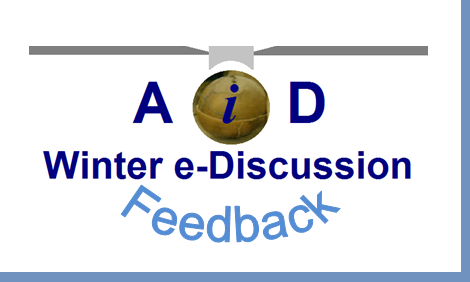 The week is also of the feedback regarding the findings of our All in Development e-Discussion held from the 5th of December 2018 to the 5th of January 2019, with a focus on a New Climate Economy. Under the Main Development section of this post, we are sharing with you some of the ideas e-discussed. Our Season of Giving through the Gifts of Peace has not yet finished. We still have 15 days to go until the end of this month. We are making a plea to those who have not yet managed to support to keep these gifts in their mind. Although the deadline for the Season of Donation for these gifts is 31 January 2019, we will still accept donations after this deadline as there are always pressing needs that desperately request support. We look forward to your support. Thank you! Review of blog readers’ comments and CENFACS’ responses. This is more than just a review. We are going to tell you what blog readers of CENFACS’ Website said. We are as well going to respond to their comments. We thank and value all the comments readers do make. However, for the purpose of this review and responses to readers, we have selected two comments only. Due to new data protection regulations, the identities of these readers will not be revealed. The first reader made some comments regarding the Review of 2018 in pictures and images we presented about CENFACS’ work. This reader’s comments were that we gave preference to pictures or images for the review rather than writing or literature. We would like to thank this reader for the comments made and their readership. We would like as well to say this. By presenting pictures and images about what year 2018 was like at CENFACS, we did not blow away our writing neither our review message. It is pointless to stress that images and pictures convey as well messages of poverty, poverty relief and sustainable development. Also, we do not let pictures and images speak for themselves. We always tell the story behind them. The second reader expressed some views that we repeat stuff on our blog and posts. Again, we would like to say thank you for the valuable comments made. We would like as well to stress that in the work we do there is a chain of events and activities. We have a programme and a calendar of works. There is a link between what we did, we do and we will do. What you may call repetitions could just be reviews. We do regular reviews on our projects and programmes. We do not need to wait the end of the financial or civil year in order to do a review. We want our readers and supporters to be able to follow us through and understand the way in which we work. It is in this way you would well understand what we are trying to achieve as an organisation. We cannot throw away our history, just because we are writing or working on something new. We hope the above responses will satisfy the above readers. However, should they need further clarification, please do not hesitate to contact us. In 2018, we launched three appeals for the DRC. Two appeals were carried out under our Light Appeal projects (addressing the two problems faced by the victims of armed conflicts and destructive natural disasters). The first appeal focused on the support of Conflict Victims while the second appeal backed the Flood Victims. Under CENFACS’ Humanitarian Disaster Relief programme (which is Rebuilding and Sustaining Infrastructures and Lives), we launched a health-enhancing emergency appeal regarding the Ebola virus there. The first wave of Winter 2018 DRC Appeal was about Bringing and Lighting a Blaze of Hope for the Hardest Hit People in the DRC by Continuing Armed Conflicts and Unfinished Business of Peaceful Transition to Political Democratisation Processes. Since there was a repeat of fights between the conflicting sides together with the flooding situation which occurred there, we appealed to you again to do something new to the complex humanitarian and democratically disputed political circumstances of the DRC. Our appeal was about supporting the ordinary local poor Congolese people who were caught in a political process they did not control, process which made their lives miserable since it began in the mid-1990s. We Lighted a Blaze of Hope for Poverty Relief and Development so that the local Congolese people in DRC could turn their two decades and half of suffering into a future of hope, peaceful and sustainable development. We advocated and hoped that the wisdom would prevail from the mindsets of all involved parties so that the lives of vulnerable and poor DRC local people could be protected while this process was still going through until it finishes peacefully. The second part of DRC Appeal was about Lighting a Blaze of Hope for the Flood Victims there. Since 2017 until this January 2018, DRC was badly flooded particularly in the North Kivu and Kinshasa to name just two of the flooded areas there. There had been a great number of homes swiped by heavy rains, collapsing walls and landslides, exacerbation of diseases with 55000 cases recorded of cholera and 1190 deaths from cholera. Adding to this pitiable picture, there were poor sanitation and lack of access to safe drinking water, poor infrastructure and flooded roads with rainfall etc. The number of deaths from flooding continued to increase. This difficult environmental health situation was happening at the time when the same country was confronted with armed conflicts over its democratic transition processes. The conflicting situation had already made the local Congolese people to pay a heavy price. Our appeal was all about going beyond the big picture of humanitarian relief aid and military intervention by doing little things such as Bringing and Lighting a Blaze of Hope for those who were in a desperate situation and had a pressing need there. Briefly, because of the greater need that arose from the current grave situation in the DRC, CENFACS appealed to the world of peace, to you to support its Wintry 2018 call of LIGHTING A BLAZE OF HOPE FOR THE FLOOD VICTIMS IN DRC. End Ebola in DRC Appeal was health-enhancing emergency appeal aimed at helping to end the Ebola virus which re-appeared in 2018 in some parts of the Democratic republic of Congo (DRC), particularly in the region of Mbandaka and in the capital Kinshasa. Ebola virus, which was discovered in 1976 in DRC, is a very deadly in its nature causing hemorrhagic fever and other health killing effects (such as vomiting, diarrhea etc.). It does cause a severely critical risk to public health as it can lead to a chain of infections. Ebola outbreak caused some fatalities that time. Because of the ferocity of this virus and the collapse of both infrastructures and State in DRC, there was a great and pressing need to make sure that the Ebola virus would not be forgotten before it spread across Africa or struck again in the future anywhere else. We then advocated that every effort to be deployed to stop it before the deadly Ebola virus became an epidemic. We thank those who responded to the above three appeals and are helping the peoples of DRC to have peace and hope. 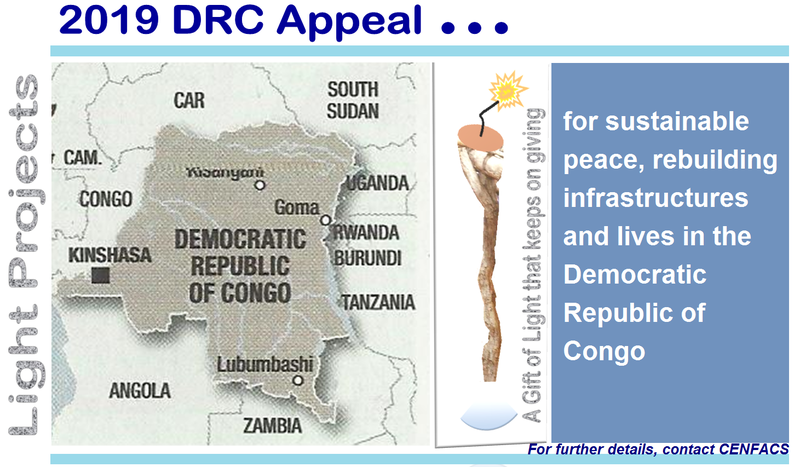 This January 2019 Light Appeal for the DRC is the continuation of the 2018 appeals and previous ones. We are currently appealing to the international development community for something to be done to peacefully resolve the legacies of the still fragile situations of previous armed conflicts, of repetitive natural disasters and of the side effects of the Ebola virus in DRC. It is also about appealing to all the players and vested interests in the DRC’s current disputed elections (presidential and parliamentarian) to resolve their disputes over the electoral process peacefully and democratically. This appeal is both a post-war and post-disaster development as there is a pressing need from the ordinary populations who continue to enormously suffer from these previous events. It is time to start thinking and awakening in terms of transitional development programme, sustainable peace and re-building infrastructures. We are particularly appealing for the current political process through the means of election (which just happened) to bring sustainable peace rather than endless disagreement with all the unthinkable terrible consequences this can lead to. We hope that the competing sides of this long overdue democratic transfer of power will come to an agreement, the wish of the ordinary peoples will be respected, the integrity of the electoral process will be preserved and the rule of law will prevail. We are both appealing to the development community from within the DRC itself and to the development community from outside to help bring sustainable peace and reconstruction of infrastructures destroyed by continuing armed conflicts and natural disasters. As we always argue that it is those little things one can do that can bring big helpful difference to the lives of those who are suffering from the above situation. These little things could include just talking to those who have the keys or powers on what is happening on the grounds. 2019 should be a turning point with this first democratic election for the DRC since the post independence era; a turning point as we are moving into a new decade – the 2020s. A new chapter from which one can hope that the new form of State, if any, that will emerge from this democratic change will be the State serving the poor, not itself. Using the underlying principles of our Light Appeal, one can say a New State that will provide the sound foundations for sustainable peace to begin and for destroyed infrastructures by natural disasters (unpredicted and planned disasters) to be tackled. There are many ways of helping; however if you decide to join the 2019 DRC Appeal, together we can undertake the following actions. ● You could INFLUENCE people both around and not around you to help those who have been still affected by the legacies of war, natural disaster, deadly virus and deadlock of the outcomes of the recent election in the DRC. ● CENFACS, contact us and/or send your support to CENFACS. This is a summary of responses and reactions to the last All in Development Winter e-Discussion which was held between 05 December 2018 and 05 January 2019. The feedback focused on Volunteering for a New Climate Economy. The key contents of this e-discussion are as follows. We welcome the buoyant views and comments expressed about the changing roles of volunteers at all levels of our organisation and the charity sector. The evolving roles include all types of functions that individuals involved in giving their time for free whether they are from within the organisation (like members) or coming from outside to volunteer. As far as volunteering for the new climate economy is concerned, the latter requires an understanding of what it can provide for everybody. Like any economy, this economy requires people to adapt and sometimes to rethink and change their way of producing, consuming and distributing goods and services. This why there is a need to volunteer for such an economy. One of the understanding things this e-discussion has revealed is how to involve volunteers in some particular tasks such as street fundraising and home fundraising using for example online and digital technologies. People volunteering from their own homes using their own devices (such as mobile phones, tablets etc.) to carry out voluntary tasks. Questions were raised regarding the way of overseeing and monitoring this kind of way of volunteering. This may require setting up some boundaries or guidelines in the forms of policies with the inclusion of methods and techniques of referencing (such as credit score and report, criminal record checks etc.). However, this can raise the issue of costs compared to the level or amount of the tasks the volunteer would undertake. To sum up, in a changing role of volunteers and in evolving economic world volunteers have their place to make the change that is needed in the lives of those in pressing needs. We would like to thank everybody for their inputs that will help to improve our volunteering policy and practice while adjusting and developing our All in Development Volunteer scheme.